Big Hungry Shelby: Is the Lobster Club a Social Club? Is the Lobster Club a Social Club? I've been meaning to catch you guys up on what's probably the best, most exciting food happening in Binghamton for a while now. And because I love you all so much, I ate there last week so I could serve up some gorgeous photos with an update on Social on State's really delicious grub. I last reviewed Social in 2014, when it first opened, and I was impressed right away. 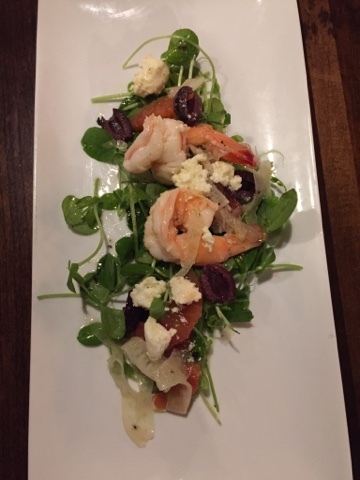 Last summer, I returned for a lavish succession of small plates on the restaurant's small but chic patio, and I've been sending everybody looking for a recommendation in the Southern Tier there ever since. If you haven't tried Chef Jay Pisculli's seasonal, creative cuisine yet, it's time to find a parking spot on State Street in downtown Binghamton and dig in. Once you've settled in to a table in the nightclub-esque dining room, order everything on the menu that contains lobster. That can change depending on the season and the specials, but something that's been available the last two times I've dined there is the angry lobster, and it's already poised to be my favorite entree of 2016. 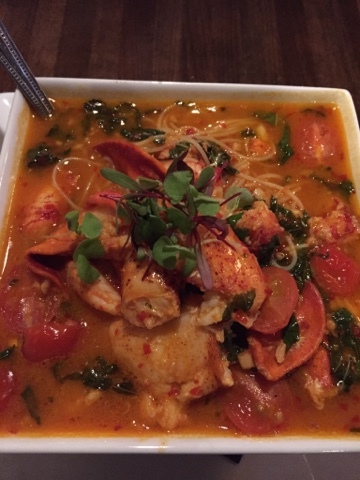 This bowl of spicy lobster broth is cradling a nest of angel hair pasta, massive chunks of tender, sweet lobster, herbs and grape tomatoes. Jay makes the broth from scratch, in accordance with the prophecy, and then adds a good amount of fruity, hot chiles to make this dish "angry." I have a good feeling he finishes the dish with a sizeable knob of high quality butter, because despite the heat, you get a creamy, pleasantly fatty mouthfeel with each bite that rounds out the spice factor in a way that might make you groan out loud. While Big Hungry Melinda and I were downing this cauldron of goodness last week, I proclaimed, "Why aren't we eating this every week?" Why indeed? 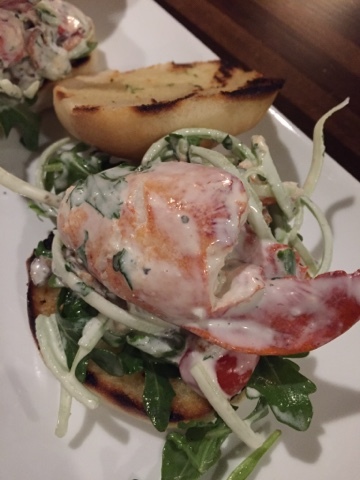 Last week, the specials menu also boasted lobster BLT sliders. If these are available when you visit, don't hesitate, just order them. This is more luscious, sweet lobster, dressed in a lightly lemony housemade aioli that will drip a bit as you devour the sandwich. Ask for extra napkins. A pillowy, toasted white bun, grape tomatoes, cherrywood smoked, thick-cut bacon and julienned celery round out the flavors to provide earthiness, salt, and bright flavors. A sprinkle of baby arugula adds a peppery edge to balance the every bite. This thing was simply fabulous. Greek salad with shrimp escabeche was beautiful on the plate and communicated loads of bright, sharp flavors from marinated feta and blood orange segments, grounded by rich kalamata olives, and sweet pea shoots, then completed, from a flavor profile point of view, really well by the briny shrimp. The angry lobster may have been my favorite dish of the night, but the beef tenderloin was no slouch. This medium-rare slice of meaty nirvana was cooked sous vide for maximum buttery tenderness, then topped with roasted bone marrow butter to amp up the salty, fatty, decadent attributes any carnivore worth her salt demands. The horseradish-spiked potato purée underneath was rich and just barely sharp. This was a masterpiece, and rivals a steakhouse dinner any day of the week. We rounded out our meal with two soufflés: corn and then cookie dough. I'm not going to lie, I preferred the dessert version. For me, the corn flavor was a little muddy, and the addition of corn kernels in the batter negated that lighter-than-air soufflé texture I was hoping to get from this side. Sliced almonds on top provided nice crunch, though. A cookie dough soufflé is...not exactly a traditional soufflé either, but instead basically a bowl of unbaked cookie dough, soft and sweet and rich. 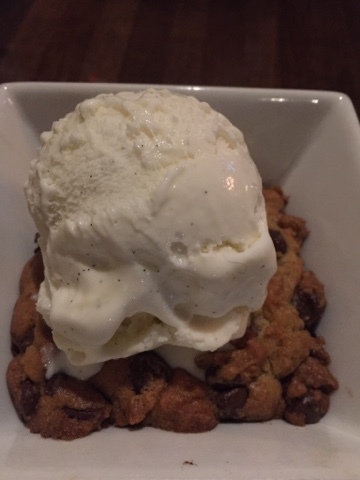 It was delicious, studded with semi-sweet chips and a scoop of real vanilla ice cream to make sure you don't get any big ideas about eating healthfully. The cold ice cream/warm cookie contrast really worked for me. Hmm, now I kind of want cookie dough for dinner tonight. Super. 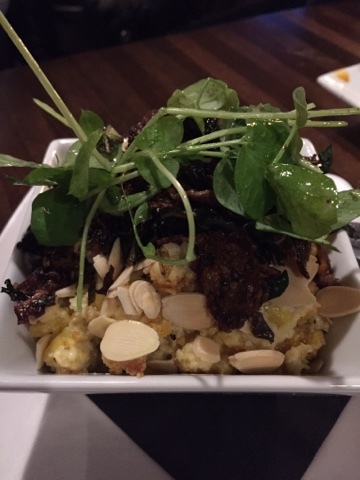 A lot of what we ordered last week was from the specials menu, which was on point that night, but Social's regular menu isn't asleep at the wheel. 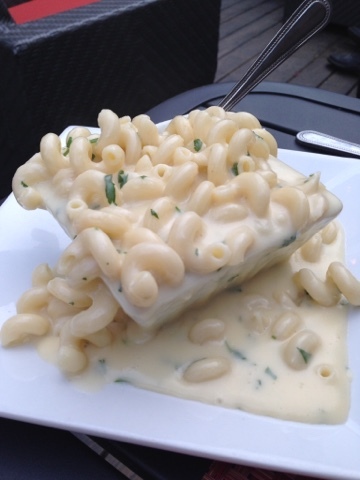 Last summer, we loved the majorly creamy macaroni and cheese, spilling out of its confines with robust, aged white cheddar flavor. Yeah. I know. You want to eat here. Me too. Everything that's going right at Social is really due to Chef Jay and his leadership in his kitchen. He has a marked commitment to creating the kind of food you don't find much in these parts: modern, decadent instead of just de rigeur, and hand crafted from the very best ingredients. The focus here is absolutely NOT huge portions at rock bottom prices. This is not a family restaurant. This is a spot for date night, girls night, entertaining clients and proving to them that Binghamton is not Podunk. 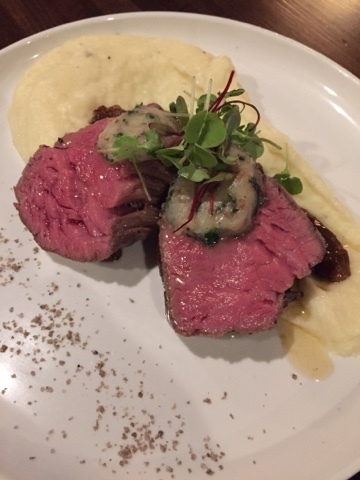 Like Loft at 99 and Remlik's, Social on State is offering that little something different, and in this case, that touch is spectacular, decidedly urban food. I'm going to go ahead and upgrade Social on State to a nine on the BHS scale. That nine reflects how hard this little bar and tapas place has worked to find its groove and prevail in its lane. I can't wait for you to find your favorite dish there and then tell me why you love it! 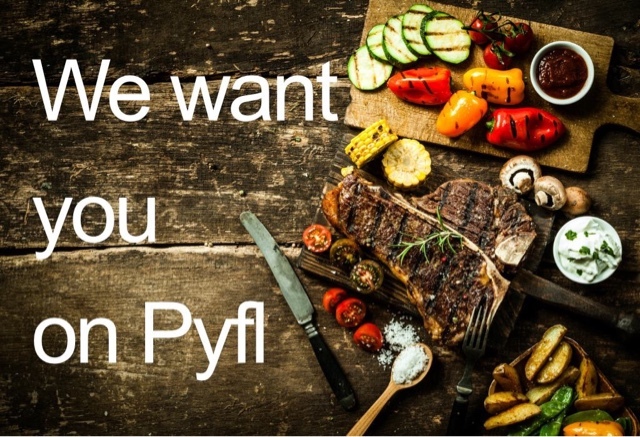 In other news, I'm excited to announce a new app (available starting today in the App Store and also whatever Android calls its App Store) called pyfl (Places Your Friends Like) that I had the opportunity to influence before its launch. I am the first Upstate New York contributor who you can friend on this social network that lets you see restaurant recommendations from people you actually know. So if you're traveling to Corning, say, you can see where I like to eat there. Look me up as Big Hungry Shelby, of course, and have fun with this new way to find great restaurants via people you trust (unlike Yelp)! Been to Social Quite a few times and never had a bad item. Always great. The beer and drinks too!